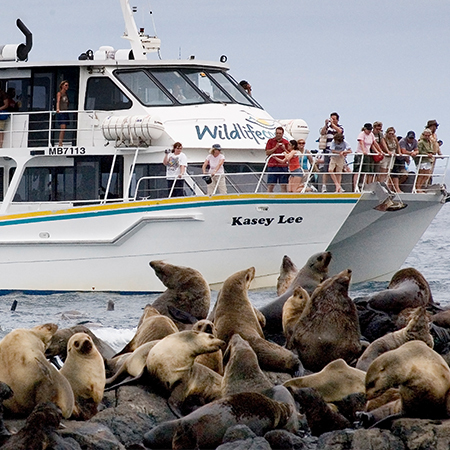 Wildlife Coast Cruises offers unique wildlife and scenic cruises around Phillip Island, Seal Rocks, Westernport Bay and Wilson’s Promontory. Your friendly captain and crew are fully qualified in sea safety and first aid, and have a thorough knowledge of local wildlife, habitat and history, which they are only too happy to share with you. A proud leader in eco-tourism, WCC boasts many environmental and tourism accreditations, and offer a range of unique cruises and tours that let you experience all our beautiful coastline has to offer. The ‘Kasey Lee’ is a 20 metre (64 foot) modern catamaran, comfortably seating 120 passengers in indoor and outdoor areas on two floors, with a fully licensed bar, souvenir and snack shop. Choose from a range of cruises; Cape Woolamai Cruise, Captain’s Lunch Cruise, Seal Watching rises, Twilight Cruise, Market Cruise, Winter Whales Cruise, and Wilsons Promontory Cruise.